The weeks since COS Conference have been quite busy, hence the lack of blog posts. I’ve been working hard to finish up my project for my Master’s International program, which has seen pretty much all the delays since I started the community needs assessment back in February of 2015. 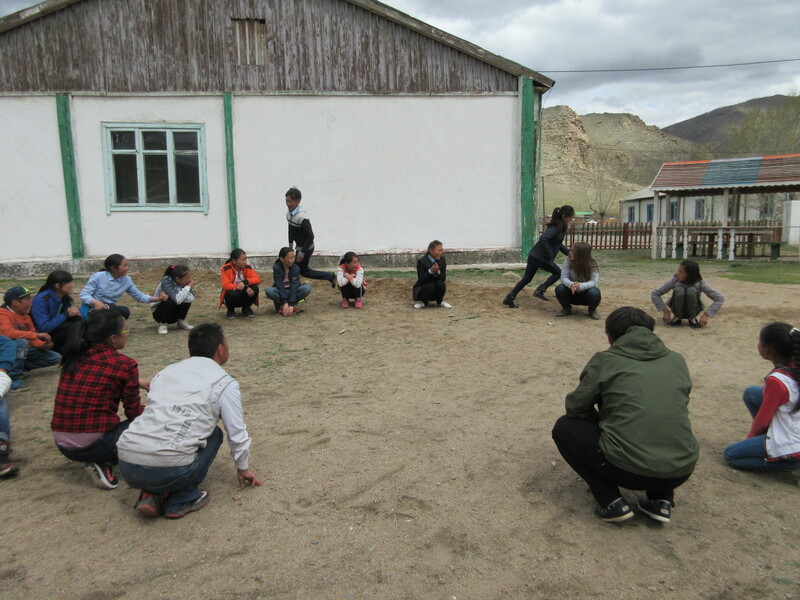 But my coworkers and I finally managed to conduct two first aid/CPR trainings for secondary school students in Shine Khoroo, a somewhat removed district of Uliastai where most of the families are herders and the older siblings are left in charge of the younger siblings during the school year. 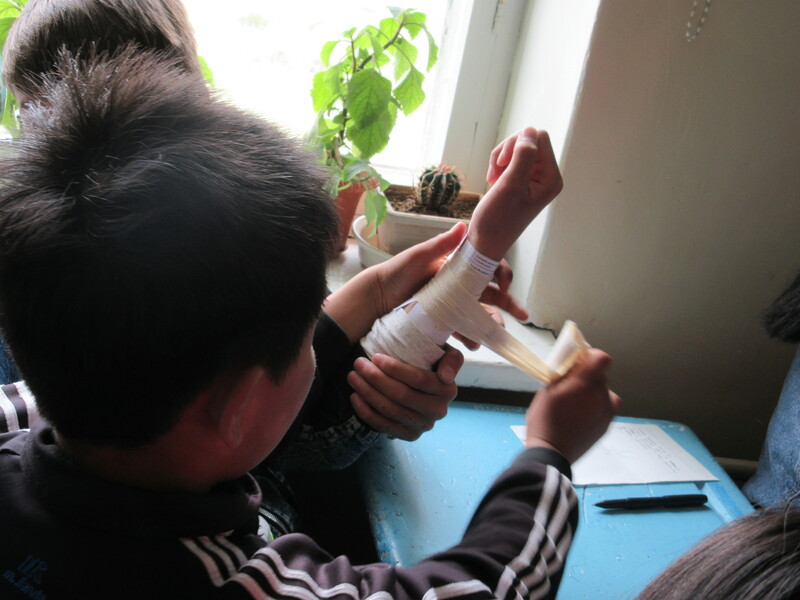 And since unintentional injuries like burns are a huge issue among children here, we thought some basic first aid training was important for students who often care for their little brothers and sisters (and it’s never a bad skill to have regardless). 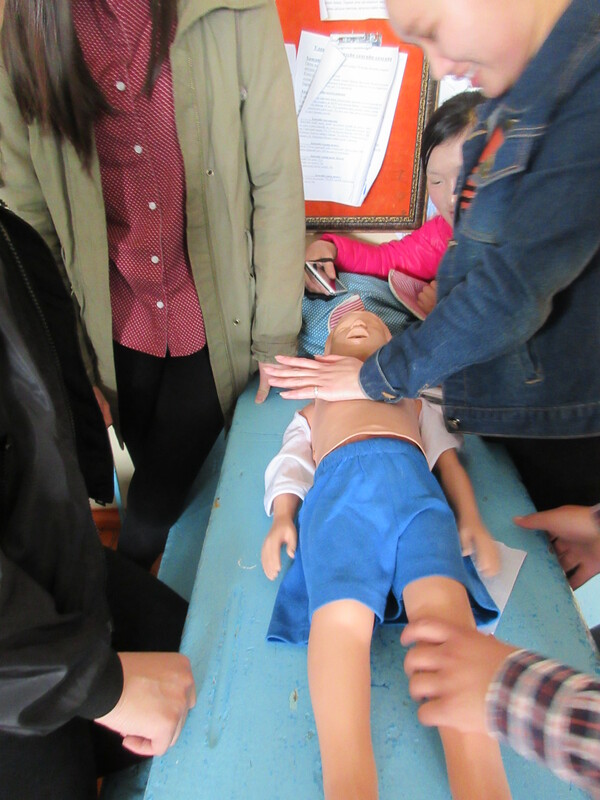 The project also focuses on accident prevention, so we designed a survey on household accidents for the parents of kindergarten students (2-5 year olds) to assess their knowledge, attitudes, and practices regarding childhood accidents, prevention, and first aid. The goal was to have about 350 parents complete the survey, but with all the delays, we ended up not being able to get the surveys printed and to the kindergartens until the last week of school. So we ran out of time and were only about to get 165 surveys completed, but it’s better than nothing. Now I get to analyze the results of all those surveys and use them to inform the preliminary design of future educational activities for parents (which will obviously take place after I’m gone). Then it’s just a matter of finishing up my practicum report and I’m all set to graduate with my master’s degree in August! Another project I’d been working on was a pilot run of Happy Center, an educational and social integration program for youth with disabilities. 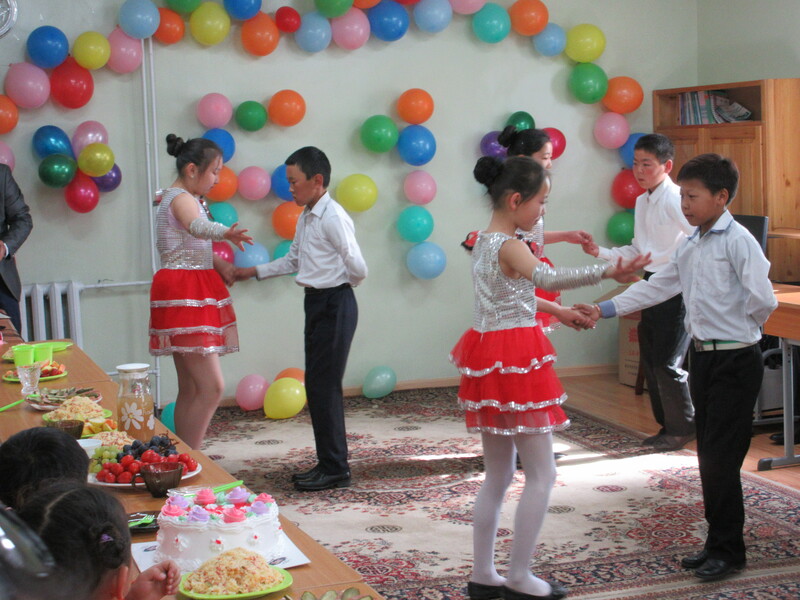 The first Happy Center was started in Govi-Altai aimag a couple years ago, and the PCVs who developed that program published a manual detailing how to start the program in other aimags. 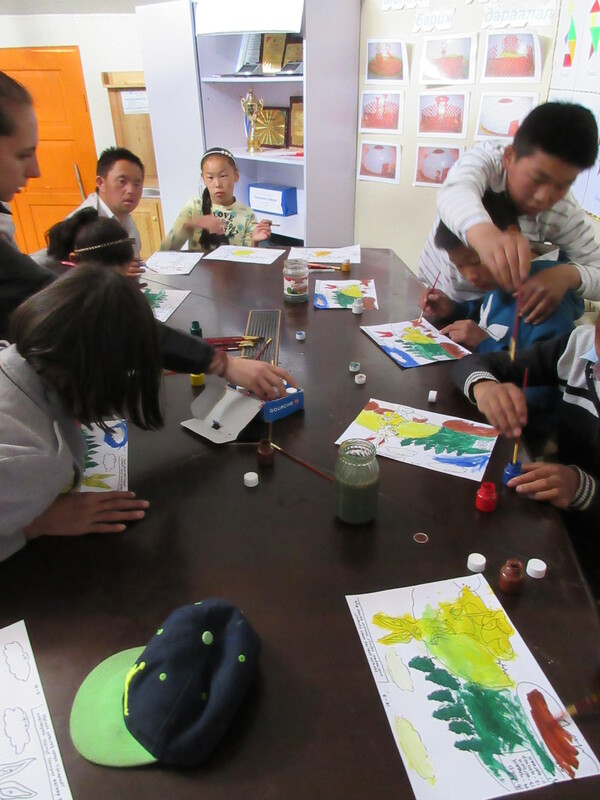 Our M26 PCV wanted to start it in Uliastai, so she worked with our local Children’s Center to get everything organized. Each session consisted of a reading or math lesson, a life skills lesson, and “friendship time” for playing games together with students without disabilities. We ended up having sessions twice a week for 7 weeks, and it went well enough that the program will probably be continued next school year. 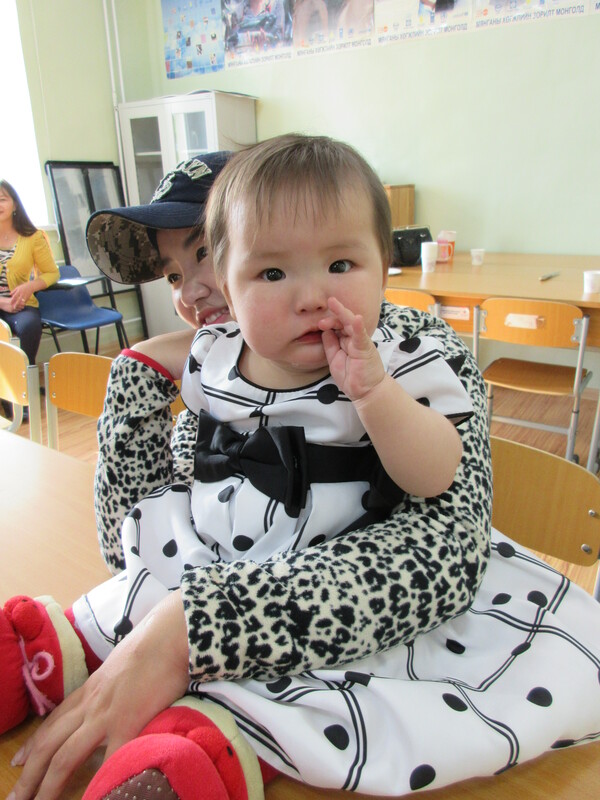 This year, Peace Corps/Mongolia is celebrating its 25th anniversary! Most of the anniversary events will happen in August after our cohort has already left, but in May PC sponsored a tree-planting event. 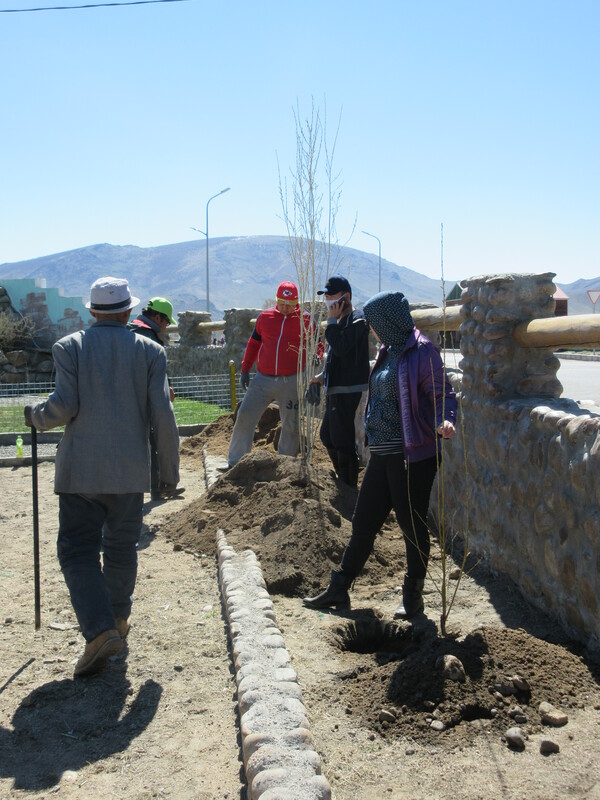 PC funded the purchase of 25 saplings for each aimag, which we (at least in Zavkhan) planted in conjunction with Mongolia’s national tree-planting day. But because spring in Mongolia is capricious to say the least, it managed to snow 3 times within a week or so of the tree planting. Luckily the baby trees survived and are now budding and thriving in the warmer, more agreeable weather. 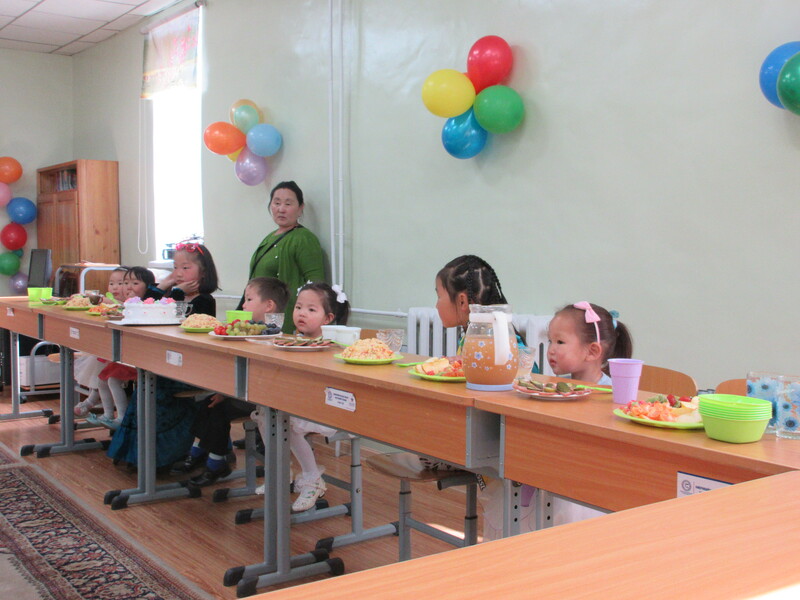 June 1 was Children’s Day in Mongolia. My coworkers brought their children to the health department, where the kids had food and drinks and performed songs and dances. This adorable little chunk is my coworker’s daughter AND my birthday buddy! After that, I met a couple of my sitemates at the local stadium, where the city-wide festivities were taking place. We wandered around for a bit and said hi to some people we know before grabbing food and calling it a day. 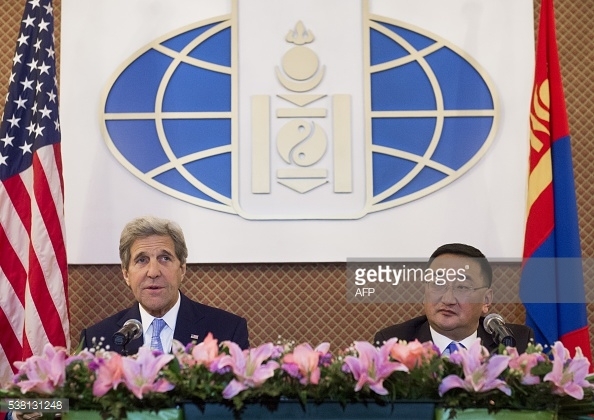 That weekend, I got to go on a short trip to UB on Peace Corps’ invitation to meet Secretary of State John Kerry, who just happened to be dropping by Mongolia on his way to China for diplomatic talks. The US embassy wanted to briefly showcase Peace Corps/Mongolia for its 25th anniversary during the event, so PC invited a group of current PCVs and former PCVs still living in Mongolia to come to the Mongolian Ministry of Foreign Affairs. All the other PCVs who were invited either live in UB or were already in UB for an event at the M27s’ orientation (yep, our newest group of Trainees just arrived! ), so why the hell was I there? Well, the weekend before that, a US congressional delegation visited UB and PC invited the handful of Volunteers who are from the districts represented by those congressmen to come as well. I was one of those PCVs, but Peace Corps ended up having to retract my invitation. The meeting was scheduled for that Saturday morning, but because of Uliastai’s infrequent flight schedule, PC would have had to flown me in the Tuesday before and flown me back the next Tuesday, and they couldn’t justify bringing me in to UB for a whole week on a account of a 2-hour meeting. So they never explicitly said it, but I’m assuming they invited me to the John Kerry thing to make up for having to miss out on the congressional delegation (which I must say, was a favorable trade). Anyway, we had to arrive at the Ministry of Foreign Affairs early in the morning and wait for Secretary Kerry and the Mongolian Foreign Minister to arrive. They went away for some private discussions, then came back for a press conference, which we got to attend (but PC was pretty adamant about not having us all whip out our cameras and phones to snap a bunch of photos, but there were plenty enough photographers from news stations and the embassy anyway). 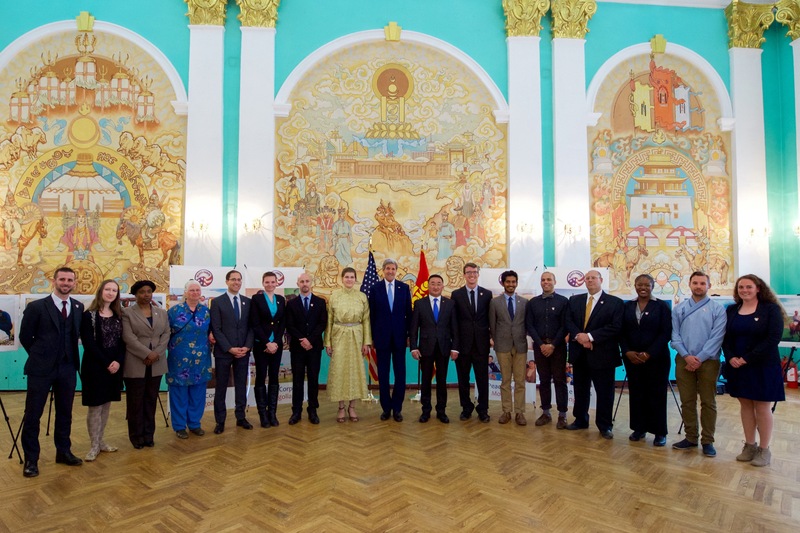 He even mentioned us (Mongolia Peace Corps Volunteers) in his comments, the transcript of which can be found here. Then like that, he was gone. He was only in Mongolia for 6 hours, and he had to get on to other things like lunch with the Mongolian president and some cultural events. But I got to meet a famous person and shake his hand, and got a free trip to UB out of it! I would call that a worthwhile weekend!